Once upon a time, Morwenna – known as Mori – did magic. She and her twin sister Mor played with fairies and closed down factories by simply each throwing a flower into a pond. Now Mori alone is in England with her all-but-unknown father and his three spinster sisters who, unsure of what to do with her, send her to a local boarding school. Here she doesn’t know anyone, and the fairies barely speak to her, it is not like Wales at all. Her loneliness is more than just being in a place without friends, though, it is also the memory of what she left behind, and what she will never quite be able to recover. Among Others is an incredibly engaging book. What is perhaps most interesting, is the confluence of science fiction and fantasy. With Mori’s belief in her ability to do magic and her discussions with fairies, the story itself is absolutely fantasy – or, also plausibly, Mori’s disturbed childhood has caused her to live in a fantasy world, and she is an unreliable narrator of the things happening around her – but much of what informs her daily life is her love of science fiction novels. Fans of classic science fiction – Among Others is set in the 1970s – will particularly enjoy Mori’s thoughts about what she is reading, and the scenes set in her science fiction book club at the library. The truly magical thing about Among Others, though, is the fact that Walton manages to so thoroughly infuse her book with science fiction without alienating those readers who don’t have much familiarity with the genre (and I would know, considering my experience with classic science fiction is limited to a single Heinlein novel read in high school). 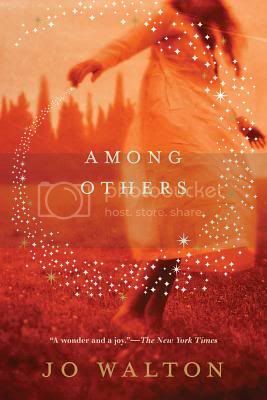 Among Others is a lovely, complex coming of age novel, and one that I highly recommend. This one is high on my list to get to. I’m hearing only good things about it! I read this last year and really enjoyed it! Not normally a sci-fi fan but this is intriguing. Great review!